The Milwaukee M12 Plastic Pipe Shear is a replacement for a ratcheting pipe cutter and it performs this function beautifully. Just as Electricians must constantly cut wire as a matter of course, Plumbers find the most repetitive task of the trade to be cutting pipe. Traditionally, we’ve used a hacksaw, a reciprocating saw, or a ratcheting hand cutter. 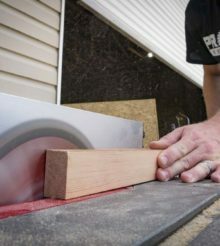 But those first two require a large working area with no wall or other obstruction behind the blade, they can result in a rough cut, and they leave a mess of pipe shavings or dust behind. The ratcheting hand cutter doesn’t need a lot of space, leaves a clean cut and no mess behind, but it’s a slow and tiresome process if you have a lot of cuts to make. The Milwaukee M12 Plastic Pipe Shear is the answer to all the objections to the usual cutting methods for Schedule 80 pipe up to 2 inches in diameter. I’ve reviewed several of the company’s plumbing tools and generally find them to be excellent. Today, I get to see if the M12 Plastic Pipe Shear is similar or just money down the drain. One of the things to keep in mind with the M12 line is that much of the focus is on creating power solutions for hand tools. So in function, the Milwaukee M12 Plastic Pipe Shear is a replacement for your ratcheting pipe cutter. Because of that, the pipe shearing tool has a jaw and blade design that resembles ratcheting pipe cutters. The comfortable, over-molded handle has two triggers – one for cutting and one for a quick blade return during serial cuts. Importantly, there’s a trigger lock since the damage the sharp, stainless steel blade and the aluminum jaws’ 1,900 inch-pounds of pressure can cut a lot more than PVC. It’s helpful to keep in mind that the tool isn’t just for PVC – it can also handle CPVC, PEX , BlazeMaster, ABS, non-metallic conduit, and rubber hose. Milwaukee claims the Shear can cut over 200 times on a charge, so I’m going to do all I can to check the company’s math! As I climbed inside the cabinet under a kitchen sink to begin to fix the…well, let’s say “mess” of a plumbing job of an ambitious but inexperienced homeowner, the benefit of the Milwaukee M12 Plastic Pipe Shear was thrown into stark relief. There wasn’t any room for a hacksaw or reciprocating saw blade to move without endangering another pipe, supply line, or wall. And in the contorted and uncomfortable position in the cabinet to use a ratcheting hand cutter would be miserable. But using the Shear resulted in safe, easy, and quick cuts to this installed pipe. It was a “Where have you been all my life?” moment! Of course, the Shear also makes life easy when you’re preparing new pipe for installation. The cuts are quick, clean, and the only manual effort required is pulling a trigger. Serial cuts are a snap – there’s a button that quickly returns the blade to the open position after the cut, so you can be ready immediately for the next one. And if you’re wondering, the blade cuts through PEX like butter, too. But the cuts aren’t the only thing that’s quick and clean. There’s no PVC dust, shavings, or other mess to clean up with this tool. You’ll notice that the cutter momentarily squeezes and deforms the pipe during the cut. This will probably be more pronounced if you’re cutting ABS. But that will happen more dramatically when the blade dulls – so it’s great that the blade is replaceable and the wrench for making the change is held onboard. Always be sure to use eye protection because old, brittle, or just cold pipe can crack and shatter during a cut! The Milwaukee M12 Plastic Pipe Shear is a replacement for a ratcheting pipe cutter and it performs this function beautifully. The biggest advantage is the ability to make quick cuts in existing pipes without endangering surrounding pipes, supply lines, or appliances. It’ll make your life easier cutting pipe on a new installation as well. It really seems to give you the best of all worlds – a quick, burr-free cut in tight spaces that doesn’t endanger surrounding work and leaves no mess. It’s also easy on your body as you don’t have to repeatedly squeeze a ratcheting cutter or use a hacksaw. The Shear goes with me to every job now, and it’s made those jobs much easier! While I haven’t tried cutting any pipe that’s already in the ground, irrigation Pros should find this model to be a solid win for them as well. A ratcheting pipe cutter starts a little over $10 and can run close to $100 for the top models. The M12 will run a little more at $139 bare or $199 if you need batteries and a charger. You’ll still have blades to replace, but the convenience is worth the premium in my opinion. I have this and I love it. It’s the best. They break under heavy use,the lower blade pops out and can hit you pretty good. So does it cut 2″ pipe 2 9/16″? Or does it cut up to 2″ diameter?